According to the National Institutes of Health, many people don’t get enough calcium from their diet, suggesting supplementation as an alternative to meet their daily required intake. Despite this dietary deficit, emerging research suggests that isolated calcium supplementation can increase cardiovascular risk. Calcium supplementation alone is risky because calcium requires other nutrients to be properly utilized. The “calcium paradox” holds that without adequate Vitamin K, calcium will not be deposited in the bones where it is required for maintaining bone strength, but rather in the arteries and soft tissues where it can cause stiffening. 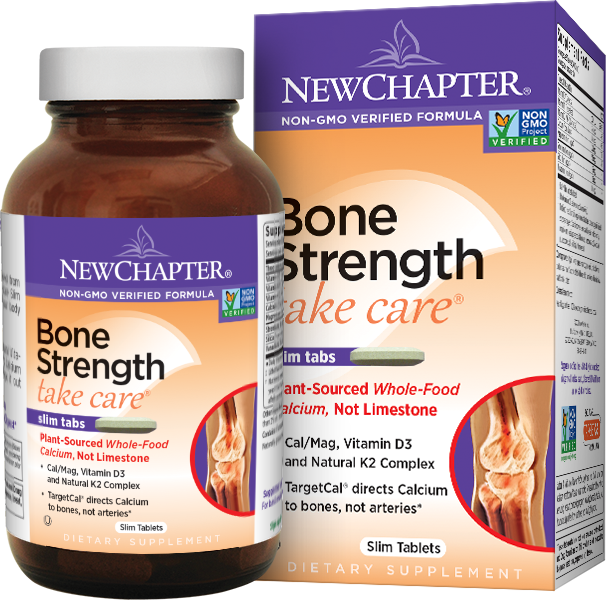 It is therefore crucial that an effective bone health supplement be formulated with the necessary nutrients and minerals to ensure the optimal utilization of calcium. TargetCal provides a highly bioavailable, bioactive, and long-lasting form of natural Vitamin K2 (MK-7). Vitamin K2 is the most active form of Vitamin K in bones and arteries. This key nutrient helps put calcium into our bones where we need it, and helps keep calcium out of our arteries, where we don’t. Vitamin K2 (MK-7), sourced from fermented whole food, gently redirects “lost” calcium back into the bone bank. The TargetCal complex is completed by Vitamin D3 — which is important for calcium absorption and has been found to aid in bone support and function. New Chapter creates whole-food complexed Vitamin D3 by culturing the nutrient with probiotics and organic whole foods. In addition to the primary benefit of promoting bone health, the ingredients in Bone Strength Take Care also provide other health benefits — including joint, cardiovascular, and eye health. The plant-source of calcium found in Bone Strength Take Care has been shown to significantly promote joint health in a placebo-controlled human clinical trial. Whole-Food Vitamins D3 and K1, along with Natural Vitamin K2 and Calcium have been shown to promote numerous components of cardiovascular health. Whole-food Vitamin D3 provides many other benefits including eye, immune, digestive, and respiratory health. † Nutrients are cultured in organic media that may contain: organic milled soy, organic yeast (Saccharomyces cerevisiae), organic maltodextrin, organic gum acacia, organic alfalfa powder, enzymes and Lactobacilli (L. acidophilus, L. bifidus, L. rhamnosus).